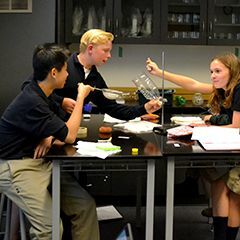 Our teaching approaches and curriculum are designed to challenge and support each student. Our mission is to challenge and inspire each student to develop the knowledge, skills and character needed to reach their full potential in life. How are we achieving our mission? We provide abundant opportunities for students to engage in high-calibre athletics, arts and other extracurricular programs. Outdoor education, travel opportunities and weekly service learning programs build perseverance, empathy and leadership. Greenwood is designed for the digital native, emphasizing fully integrated technology and collaboration tools. Our vision is that Greenwood will lead in providing a customized, engaging and character-building experience that prepares our students to make a positive difference in the world. Learn more about what sets the Greenwood community apart.